How do I know I’m visiting a secured site? How do I access loss runs? You can pull loss runs from the main menu of Edge under the claims section. Simply click on Loss Runs. You can then run Loss Runs for Agency or Loss Runs by Policy and/or account. Click on View Loss Runs, You can print or save to your computer. It’s a convenient way for our policyholders to pay multiple policies through a combined bill. As a policyholder, you can choose direct billing on an account or authorize a monthly electronic funds transfer from your checking or saving account. Each billing number is unique number; generally, a billing account will begin like this: ABIA0500022222 – AB for account bill, IA represents Iowa (this will reflect your State), 0500022222. How many years does MFM look at for violations and accidents for personal auto policies? We underwrite for 5 years but only surcharge for the past 3 years. Violations and/or losses in the 4th or 5th year may affect tier placement (and pricing). All insureds with a major violation/accident automatically need underwriter approval. When and why do I contact my Agent? Your Agent is your insurance coach and consultant. As such, he/she should be involved and aware of all major transactions related to your insurance coverage. All changes, claims, and policy coverage questions should be directed to your agent. How can I request loss runs? Your Insurance Agent can provide you with loss runs. What should be done after an automobile accident? 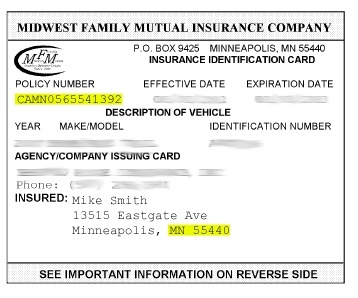 Name of the other party's insurance company, the policy number and the vehicle license plate numbers for each vehicle involved. Do not discuss the accident with anyone except your agent, your company or the police. How do I report a claim to MFM? 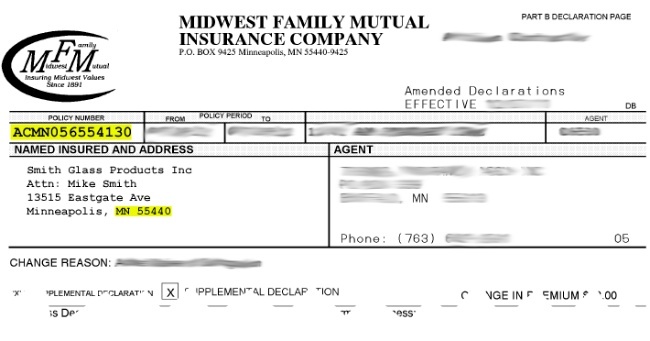 Anyone insured by Midwest Family should contact their independent agent directly to report a claim. The agent's name, address and phone number are prominently displayed on each policy. Midwest Family deals exclusively with independent agents who are nearby and ready to provide personalized service. Our claims staff will respond to claims within 24 hours to advise you what is being done to handle your claim. Our emergency number of 1-800-CALL-MFM is answered 24 hours a day, 7 days a week to give instructions on what to do in an emergency situation. How does MFM underwrite my "credit score"? MFM does a "qualitative" review of credit. We don't look at the credit "score" so much as the qualitative items on your credit report. Specifically, we look for bankruptcies, judgments, collections and liens. If none of those items are on your record, your credit is considered satisfactory. If any of these items IS on your record, we may cancel or surcharge your policy depending upon other underwriting factors and within the legal scope of state specific regulations. You may register for our online Insured Portal by clicking the "Register" link in the upper right portion of www.midwestfamily.com. From there, you will be able to inquire on policy information and make payments. Why can’t I pay my auto, property, umbrella, business, contractors, commercial auto, work comp or commercial umbrella insurance bill through the Insured Portal? The policy may have been cancelled, please contact your servicing agent. How do I know I’m visiting the authentic Midwest Family Mutual Website? When the insured signs in for the first time, they will be brought to the ID Shield page. The purpose of ID Shield is to add an additional layer of security and to provide confidence to the insured that they are logging into the legitimate Midwest Family website.